Great community radio produced by volunteers, passionate about how radio can improve the lives of individuals and communites by broadcasting, relevant, locally focused and locally produced programmes. Beyond Radio has already proved itself as an excellent community resource, both for the 56 volunteers currently registered with us, who have received training in broadcast techniques and for our growing listener base, to whom we have provided information to relating to subjects as broad as Female Genital Mutilation and Dementia. Our volunteers range in age from 8 to 83 years old. All came to us with no experience in broadcasting but now broadcast a wide selection of shows and community material to our district on a weekly basis. Beyond Radio exists to benefit the community we serve in a number of ways. It provides volunteer opportunities and gives local people the chance to be involved in and gain experience from an industry which is notoriously difficult to access. In many of those cases we have seen self-esteem and self-confidence grow as a result of broadcasting. With an open access policy we don't discriminate against anyone on age, gender, ability, social or cultural grounds. There are very few opportunities for those with disabilities to get into the broadcast industry. We don't see disability as being a barrier to broadcasting and have in the past been able to give an 'on air' voice to a volunteer who had no speech capabilities through the use of technology. Very few radio stations offer fully accessible studios and we want to be one of the first in our region and act as a champion in order to raise the profile of disabled members of our own community in order to encourge others to do the same. We want to be an example of best practice. We have anumber of disabled members on our volunteer team, and whilst we try our best to support them fully in their volunteering experience we feel we often fall short due to the restrictions our current studio offers. We are very passonate about how community radio can transform lives and communities. Since we moved into our premises in an urban ammenities park, residents tell us that anti-social behaviour has reduced dramatically, with very few incidents occuring since we took up residence. The radio station so far has been a catalyst in bringing residents together to make improvements in the park, which has been in need of some TLC for several years. Younger children are once again using the play area and the tennis courts are back in use. We are in discussion with the resident group about partnering for funding to further transform the park into a family friendly space from the former unloved area in has been for a number of years. The changes to the buiding we are operating from will be a visible first step in this wider desire for improvements that will benefit this part of our community. We were very pleased to be awarded £9960.00 from the Awards for All stream towards our project. 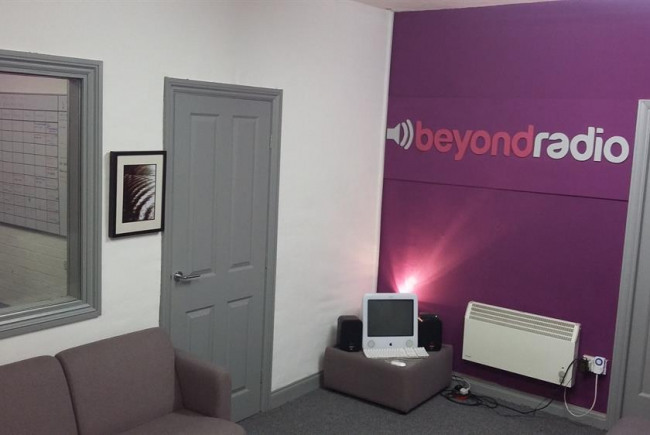 Beyond Radio is a community radio station serving the diverse communities of the Lancaster & Morecambe district. We are a fully voluntary, not for profit community organisation who provide an alternative radio service to our district. We exist to offer a wider choice to our listeners and meaningful life chances to our volunteers, to whom we offer broadcast training. Our volunteers vary in age from 8 years old to 83. Beyond Radio also supports other community groups and charities in our area, offering them a new route to service users and potential volunters and donors. We also champion local music and the arts, giving airtime to local musicians of all abilities and promoting arts events in our area. The station is here to promote cultural exchange and bring people closer together with a common aim of improving our district. Project Delivery Manager: Beyond Radio The Project Delivery Manager takes legal responsibility for receiving and spending the funds raised and ensuring the project is delivered. Contractor: GD Funding The team responsible for building or installing the project.